Stanford opened its season with two straight meets in Sacramento, putting up two fairly good road scores. But from what we saw, it seems that the Cardinal’s fate will depend completely on the performance of Kyla Bryant, its sole all arounder. It’s very encouraging that Stanford has been putting up six routines on every event though and that it even had backups for week one routines that didn’t work out. I’m also really excited about the performances of the three freshmen who have cracked lineups so far. For Cal, I’ll be watching how freshmen Maya Bordas and Milan Clausi perform in their home debut. 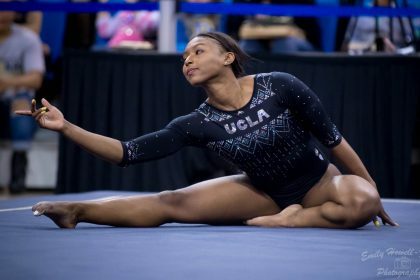 They’ve both had very promising starts to their seasons, and I think both their routines and their scores could blossom at home and in conference. It’s already worth keeping an eye on Abi Solari, who had a great debut in week one and then sat out at California Grand last week. Here’s your Relevant Tweet Dump TM. Brunette making her debut on bars! GEORGE – CAL: Beautiful full, laid all the way out, and STUCK! Really nice. LAWSON – STAN: Maloney to bail is okay, bit of leg sep, toe full to double back with a step. SY. SEILNACHT – CAL: Full, pretty in the air but not a big block, big hop back. WAGUESPACK – STAN: Toe on to Maloney, nice Pak, half turn on the low bar maybe a bit slow, double lay with two quick steps back. Nice! She’s technically great, just limited a bit by a foot injury in the fall. 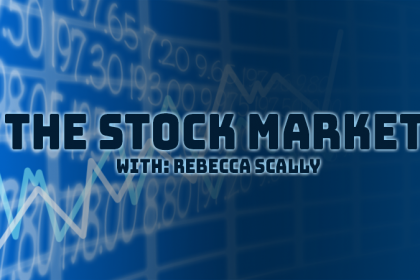 MASTRANGELO – CAL: Looks a bit messy in the air but another near-stick from the Bears! Okay, in slowmo she definitely had a hop back. YU – STANFORD: Maloney to bail to Ray! Ooh difficulty. Stalder to double back, high and stuck. NICE. CLAUSI – CAL: One and a half, oof DEEP with a big step forward. Looked okay on the block, maybe a little high on the table? BRYANT – STAN: Toe on to Tkachev really nice. Having her in the four spot is really odd, might be trying to Bridgey the last two a little. Great Pak, this is lovely, double lay flared with a hop back. WILLIAMS – CAL: Huge full, beautiful, little shuffle back. BRUNETTE – STAN: Seattle girl! Half turn to Deltchev to overshoot and gets through it!! Caught that at full stretch. Hollowed double lay bordering on piked with a step. Commentators think she caught her foot on the mat at the bottom there. I didn’t see it, we’ll see what the score looks like. JONES – CAL: Okay full, hits WAY back on the table. Gets it around but it’s nothing special. FLAM – STAN: Toe blind to Jaeger, not bad but not crazy height. Handstands getting wild, messy bail, really struggling on her casts, FTDLO dismount off to one side with a hop. Not a stellar start for either team, but they’re getting through okay. A few excellent routines, a few pretty iffy ones on each side. COLE – STAN: Pikey full but clean enough with a hop. JONES – CAL: Maloney to Pak is okay, little bit wonky, full in dismount with a step back and a massive college salute. FITZGERALD – STAN: Block way back on the table, gets it around but lands way forward, rebounds, barely avoids putting her hands down. GEORGE – CAL: Solid Tkachev to start, nice bail,toe on to full in dismount STUCK. Very very nice. BRYANT – STAN: Full is not her best but still very good, clean with a hop back. KUC – CAL: Meloney to Pak, hits the bar straight on and can’t work perfectly out of it but not bad, full out dismount with two steps. FLAM – STAN: Nice clean Omelianchik, hop and a step forward. WATTERSON – CAL: Nice Pak, toe on to van Leeuwen gorgeous. Tow full to double back STUCK oh just kidding she hopped to salute but still really nice. YU – STAN: Really pretty full, hop straight back, lots of amplitude. SCHANK – CAL: Gorgeous pike Jaeger as usual, and a very serious stick on her double lay. Back on her heels but she’s there. GARCIA – STAN: Chaotic Tsuk full but lands it pretty well! Not much block, almost kicks the table, got lucky. 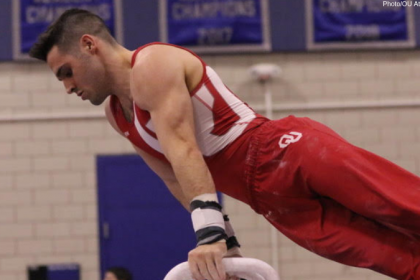 SHU – CAL: Bars debut this year. Toe on to Ray to overshoot, pretty good, think she missed a handstand there, double lay underrotated with a step forward. Fantastic few bars routines at the end there for Cal. Not sure why Shu’s in the anchor there. 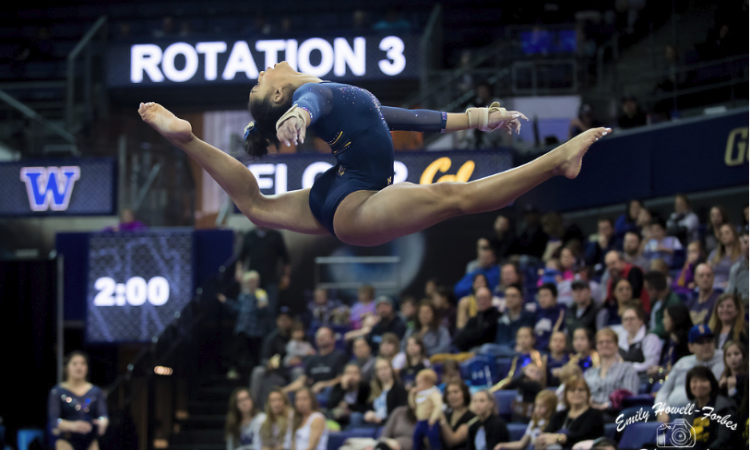 GEORGE – CAL: Cat leap front aerial back handspring is great. Sorry, lost track at the end there, trying to figure out the lineup change. Looks like Watterson is out of the anchor for Cal, Shu going in. COLE – STAN: Apparently there was a literal cell phone on the floor that they had to remove.Two and a half punch front just stayed in, she had to hang on with her toes. Great straddle series as always, nice Rudi to close. CLAUSI – CAL: Switch switch is beautiful. BHS LOSO with a quick check, her choreography is beautiful, hitch kick side aerial back full with a hop. H. HOFFMAN – STAN: Front thru Rudi is beautiful, great leap series, double back… huh. She landed really hard a touch forward but managed to pull the lunge out. Awww, Milan Clausi in the corner cheering for her. KEELEN – CAL: Full turn nice, nailed her acro series, switch to ring jump, front aerial, got her skills out of the way really quickly there. One and a half twist felt really low but stuck! That routine takes all of about twenty five seconds. FLAM – STAN: Awkward landing on her double arabian, bit deep with a quick step. Front full front pike is great and solid landing on her double pike. SO. SEILNACHT – CAL: Full turn, BHS LOSO with a bit of feet but really solid landing. Switch double stag, tiny adjustment, side aerial back full stuck. LAWSON – STAN: Much more dynamic choreography than her freshman year. One and a half through double back opening pass and stays in!! Tour jete half split full really nice and she looks like she’s having fun, which is great for an athlete whose nerves can read really clearly in her face. Double pike to close, nailed it. That’s great. She’s starting to live up to her potential this year. WILLIAMS – CAL: Punch front LOSO, really nice, switch switch side nailed. Gainer pike stuck. The Bears are starting to pick up speed here. HOANG – STAN: One of my favorite opening passes here. Double lay is gorgeous, lunges forward but it’s not meaningfully underrotated. Double lays with perfect leg form are so rare and amazing. Front lay front full, ultra dramatic choreography, double pike to her knees OUCH. SHU – CAL: Front aerial to bhs is great, hitch kick side somi. Switch leap, comes down the side of the beam. Repeats and it’s okay, side aerial tuck back full. BRYANT – STAN: Full in nailed today. We can see Watterson exhibitioning beam in the background. Front thru double pike, has to pull the front foot back because somehow she overpowered that, switch side to Popa. Open double back to close!! Ridiculous. Stanford isn’t letting Cal run away with this, but the Bears are unlikely to surrender the lead on home floor. I’m really fascinated by the all around battle between Kyla Bryant and Kyana George. Bryant has a half tenth lead, but George is heading to floor and could close the gap. 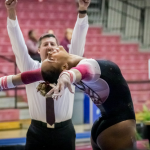 COLE – STANFORD: Dance out of her front aerial that might have been a check. Gorgeous dance skills like usual. Double full dismount with a big hop back. SO. SEILNACHT – CAL: Cool creepy music! Front lay Rudi double stag really nice. Illusion turn, tour jete 1/1 I want to say? Some leaps pivot so hard out that it’s hard to tell where they stop. Amanda said the middle pass was a one and a half twist but I’m pretty sure it wasn’t. One and a half punch lay to close. STEPHENSON – STANFORD: Love her hair. Front aerial is beautiful, she’s definitely got the Legacy Elite look. BHS LOSO is a little off line, tries to work through it, has to bend and grab the beam. Switch sheep with another check, poor thing’s got hair in her mouth now, gainer full stuck. MASTRANGELO – CAL: I hate the hands clap music so much. So much. One and a half front lay is stuck, two and a half twist to close. LAWSON – STANFORD: Standing Arabian with a foot shift, YES get it. That skill is so impressive. Cat leap switch half is really good, nice full turn. BHS LOSO a little off line but covers it pretty well, gainer pike with a step. GEORGE – CAL: Front thru Rudi, switch ring thru tour jete 1/2. This routine is really fun. Really nice front double full, ugh comes in short on her double back and lands it on hands and knees. BRYANT – STANFORD: Nice full turn, BHS LOSO with some knees. Beat to switch split jump. Punch front with a check, beautiful double back dismount not even cowboyed with a cross step. CLAUSI – CAL: Her choreo is fantastic. Full in is half laid out and landed fantastically. Switch side Popa is lovely, front double full beautiful, one and a half front lay. Incredible. 9.925!! FITZGERALD – STANFORD: Full turn pretty, front aerial back tuck. Switch to split, beautiful, hitch kick to two foot aerial, almost didn’t make that, one and a half with a hop. WILLIAMS – CAL: Full in great. Apparently that’s new! Switch side Popa great, OOF terrifying half sideways landing on her front full, I think one ankle rolled but she’s okay. Double pike is good. FLAM – STANFORD: No problem on the two foot layout. Is her beam music Despacito? There were skills in the middle, I’m fading, punch front full stuck ish. SCHANK – CAL: SHE’S STILL DOING THE I WRITE SINS ROUTINE AHHH. Double pike good, step forward, front lay front full I think really good. A little low on her wolf full, no big deal, Rudi landed!!! Amazing lineup debut from the soph. She was always too good to be a one eventer.